A stand bag has built-in legs that unfold when you set the bag down. 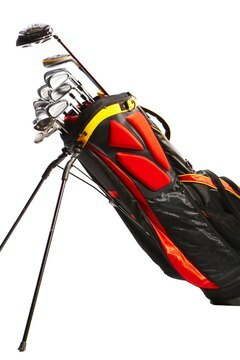 When shopping for a new golf bag, it is important to select one that meets your needs as a golfer. Every style of golf bag has the purpose of holding your clubs and other objects such as balls and tees, but bags typically fall into the category of a cart bag or a stand bag. A cart bag is a golf bag that you must place on a hand cart or power cart to take around the course. Although this style of bag has a strap to allow you to sling it over your shoulder, it isn't able to stand effectively on uneven surfaces. Cart bags can stand on a smooth, flat surface, but won't typically stand upright on a fairway. When you use a cart bag, you must buy or rent a hand cart or attach the bag to the rear of a power cart. Cart bags typically are roomier and allow for more separate compartments for better organization. A stand bag has the general appearance of a cart bag, but its added benefit is a set of two built-in legs that allow the bag to sit at an angle when you're taking your shot. Although this style of bag can often fit in a cart, most people who use stand bags carry them during their round of golf. The bag has a carrying strap or backpack-style harness to make carrying it easy. These bags are smaller than cart bags and more compact, so there is limited room for extra equipment and supplies. The most significant benefit of using a cart bag is that you can push or pull the bag around the course in a cart. This method of transportation means you don't have to carry the bag over your shoulder, which can become arduous over several hours. A drawback to a cart bag is that you must obtain a cart to transport the bag at additional cost. Sloped terrains can also make pulling a cart difficult. If you use a stand bag, it adds an extra element of exercise to your round of golf. Given the weight of the bag, carrying it for several hours can burn fat and increase your endurance. Additionally, this style of bag is easy to set down in virtually any environment, including on slopes. A drawback to a stand bag is that if your bag is too heavy for you, carrying it can make your back and shoulders sore.